In yesterday's post I wrote about Jeff Goin's My 500 Words writing challenge and how participating helped me discover writing process. After writing my memoir, which was for personal satisfaction only, I decided to write a brief e-book on my writing process. I primarily did this in order to experiment with Amazon's Kindle publishing. The book is 60,000 Words in 6 Weeks. While researching some topics for my book, I came across a book by Katharine Grubb, Write a Novel in 10 Minutes a Day. I also discovered the associated Facebook page, 10 Minute Novelists. 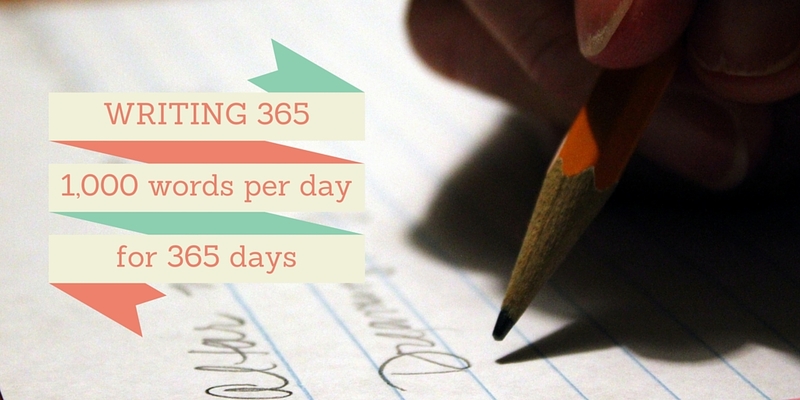 It was on this Facebook page that I first read about the 365K challenge: writing 1,000 words per day for 365 days. Considering that most novels are between 80,000 and 100,000 words, 365,000 words is essentially four novels. For several weeks I wondered about this challenge. Could I do it? Could I write 1,000 words every day for an entire year? I had thought before about the idea of writing 250 words per day, resulting in a cumulative year-end total of 91,250 words. After deliberating for a few more days, I decided that, yes, I would try to sustain consistent output for 2016. The next logical question then became, what should I write? At first I decided that I would come up with a series of e-books, one per week, at 7,000 words per book. I created a list of topics and developed a seven-point outline, so that I could cover one point per day. However, after thinking about this process some more, I opted for a different approach: a smaller number of words in different categories of writing. My goal is to write 250 words per day in each of the following categories: personal journal, blog post (what you're reading now), e-book (using the outlines I developed), and a daily devotional. I like this approach because I can spread the writing out across my day. In the morning I hope to write my devotional entry. Just prior to bedtime, I will type out my personal journal notes for the day. Sometime between morning and evening I will fire off a blog post and continue working through the e-book in progress at the time.